Afraid of the Dentist? Don’t Worry, Your Naples Sedation Dentist Has You Covered! An estimated 15% of US adults experience dental phobia or anxiety every year. If you’re one of the 40 million patients who avoid or neglect oral health because of fear, Dr. Mark Makram and his Naples, FL team invite you to give us a chance. We work hard to make every patient feel comfortable in our office, and confident with any dental procedure we recommend. For those who suffer from severe anxiety, we also offer a full range of sedation dentistry services. Dr. Makram is trained in dental sedation, and administers nitrous oxide, oral conscious, and intravenous (IV) sedation in the comfort of his Naples, FL dental office. Nitrous oxide sedation – the most common and one of the oldest forms of sedation available, nitrous oxide, also called laughing gas, is inhaled by patients throughout their procedure. Patients enter a euphoric state with decreased pain response and increased relaxation. Effects wear off quickly, and the patient may drive to and from the appointment without assistance. Oral conscious sedation – a great option for patients whose dental anxiety makes it difficult to leave home, those who choose oral conscious sedation take a pill at a predetermined time before treatment, and arrive at our office already relaxed. Throughout treatment, patients are relaxed, and most even forget their treatment following the procedure. Because the effects are long lasting, patients should have a trusted friend or family member transport them to and from the appointment. Intravenous (IV) sedation – the best of both sedation options, IV sedation is administered in our office by Dr. Makram. 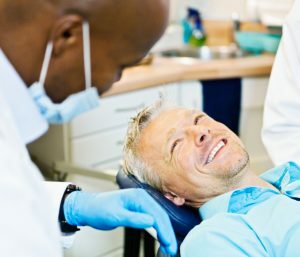 The level of sedation is similar to that experienced by patients using oral conscious sedation, but like nitrous oxide, the dosage can be adjusted throughout treatment to maximize results. Patients need a friend or family member to drive them to and from their appointment. If you’ve been avoiding or neglecting your oral health due to fear, let Dr. Makram and his friendly team help you. Contact us today to schedule a sedation dentistry consultation. Dr. Makram is happy to meet with anxious or fearful patients, and discuss treatment options to ensure patients are completely comfortable with their oral health care plan. Comments Off on Afraid of the Dentist? Don’t Worry, Your Naples Sedation Dentist Has You Covered!